Charlotte – 13 | Mezashite! 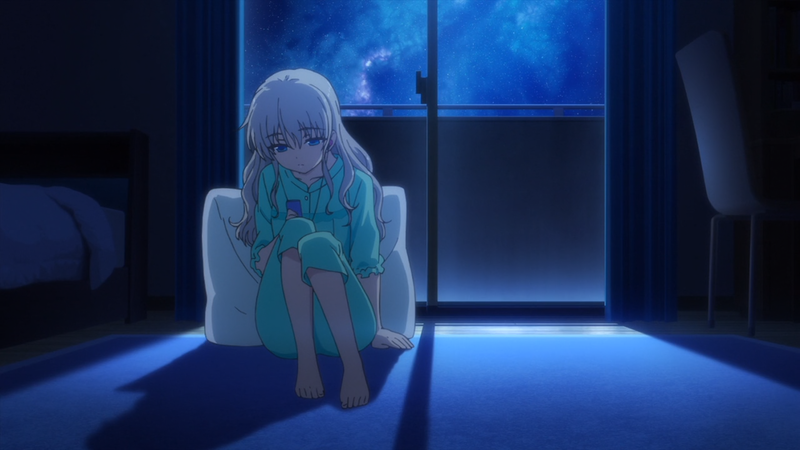 Tomori is so the best. Well. It’s over. Joint with Good Job! Media. I’m going to write up a separate post later with series-wide translation notes, non-translation notes, and translation non-notes. But first, staff reflections. Well, first, the release. Then, the staff reflections. I really thought that Brynhildr would be the last show I translated, but when Charlotte came around, I thought “Hey, I haven’t actually ever translated a show with any sort of hype whatsoever—I should get in on that!” And here we are. I feel like I scored a bunch of achievements in the game of fansubbing with this show. The baseball episode was particularly enjoyable. As for the show itself, I don’t know how to feel about it now, but I’m sure I’ll think back on it fondly years later, kinda like how I felt about Angel Beats. That last scene, though—shades of Aozora from Air and Kage Futatsu from Clannad. Not quite Chiisa na Tenohira though. I’m not sure what happened here. All I know was that the most exciting part of the livewatch was the Rewrite anime announcement. The only theme I could spot was siblings. If anyone at all knows that the moral or lesson of Charlotte was supposed to be, please tell me. I am an anime expert, and I still don’t understand. The show was decent IMO. Agreed that we all had high expectations from this show but nevertheless it was a quite fun to work on. Kudos to Asenshi GJM & Mezashite staff for doing such a great work and dealing with my slack. Anyway, Next stop TariTari HaruChika. Well, this was certainly a fun show. It didn’t turn out as well as I’d hoped in the end, but I’m still glad that I can say that I was able to offer a good release for a Key anime. On top of that, working with Aka and Eto from Mezashite was an experience I would like to repeat in the future, hopefully we can find another project sometime. When I heard Angel Beats was getting some sort of spiritual successor, I was excited to get involved, so I’m glad I got to contribute a meager amount of typesetting. Also, I finally got around to watching the first two episodes from Aniplex, and I can safely say that those “official” subs singlehandedly justify the existence of fansubs. Haro-Haro, anyone? Don’t ask me, I just make sparkly text. > All I know was that the most exciting part of the livewatch was the Rewrite anime announcement. Thanks for the whole series and the great subs! > If anyone at all knows that the moral or lesson of Charlotte was supposed to be, please tell me. The Power of Promise, i think? Thanks for all your work on the series! Thank you for your wonderful subs!